WHAT WERE THE PANEL'S MAIN FINDINGS? WHAT IS THE TAKE-HOME MESSAGE FOR CLINICIANS? WHAT ARE THE SHORTCOMINGS IN THE PUBLISHED STUDIES? COULD YOU HIGHLIGHT FINDINGS FOR EACH OF THE TESTS REVIEWED? WHAT AREAS STILL NEED WORK? ADVANCES IN MICROARRAY screening for genetic defects make it more likely that clinicians will be able to provide a specific etiologic diagnosis for children with global developmental delay or intellectual disability, the evidence report found. Although there are challenges yet to be overcome in the diagnostic evaluation of children with unexplained global developmental delay or intellectual disability (GDD/ID), genetic and metabolic screening tests are increasingly useful, according to a review by the AAN Quality Standards Subcommittee and the Practice Committee of the Child Neurology Society. 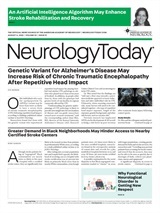 The review was published in the Sept. 28 online edition of Neurology. In an interview with Neurology Today, AAN subcommittee panelist David J. Michelson, MD, assistant professor of neurology and pediatrics at the Loma Linda University School of Medicine in California, discussed the findings and their implications for clinicians. What we found is that advances in microarray screening for genetic defects make it more likely that we will be able to provide a specific etiologic diagnosis for children with GDD or ID. We also found, in the process of disseminating the findings of our review, that it remains important to advocate for the benefits of testing on behalf of these children's families. THIS IS ESPECIALLY HELPFUL IN CHILDREN WITH UNEXPLAINED GDD AND ID, CORRECT? Yes, in particular, because an etiologic diagnosis has greater psychological benefit to their families. Children seen for GDD/ID who have multiple congenital anomalies, dysmorphic or syndromic physical characteristics, or a strong family history for cognitive disorders would likely be recognized as having a genetic etiology on the basis of the clinical evaluation — though there is still significant benefit to the family to determine the specific genetic changes. Our review found that genomic microarray studies were diagnostic in around 8 percent of all children with GDD/ID, but yields were nearly 11 percent for children whose clinical evaluations were strongly suggestive of a genetic etiology. That said, it is important to emphasize that most of the studies we reviewed only provided Class III evidence, largely because the subjects were referred for testing from neurology and genetics clinics, where most decisions regarding testing are and will continue to be made. The yield of a given test is admittedly only one of many factors to be considered when planning a diagnostic testing strategy for a child with GDD or ID. Other factors include the ability of a test to identify a treatable disorder; the pretest probability of presence of a disease based on clinical features and family history; and the availability, invasiveness, and cost of testing. Newer genetic and metabolic tests are increasing our ability to provide an etiologic diagnosis for children with unexplained GDD/ID. Genomic microarray may be the most appropriate first screening test in many situations. When it is unclear what testing should be performed, clinical geneticists and experienced pediatric neurologists can be great resources. An etiologic diagnosis may be elusive but has many benefits for patients and their families. HOW HAS DIAGNOSTIC SCREENING TECHNOLOGY IMPROVED SINCE EARLIER REVIEWS OF THE LITERATURE? Previous reviews and parameters have shown that GDD/ID can be explained in about two-thirds of children on the basis of the clinical evaluation and basic screening tests. The prior practice parameter concluded that there were benefits to genetic and metabolic evaluations for children whose GDD/ID remained unexplained. Our current review shows that newer screening techniques are improving our diagnostic yield in these cases. Even within the category of genomic microarrays, technological advances are leading to increasing test sensitivity. The older studies we reviewed used arrays with probes looking for duplications and deletions of segments a million base pairs long. This was a great improvement over the sensitivity of a standard karyotype, but currently available genomic microarrays combine millions of individual tests for duplications and deletions of segments as small as several thousand base pairs. We are now struggling to better understand which of these copy number changes affect cognitive development, and how they do so. A positive result on a microarray study is not necessarily diagnostic, and needs to be interpreted with caution. In some cases, testing both parents is necessary for the proper interpretation of the result. Consultation with a medical geneticist or genetics counselor, available at most children's hospitals, can be invaluable when the results are inconclusive. The biggest problem is that there are no trials that compare different diagnostic screening strategies in similar patients. As most of the studies were reviews of a single test, it is difficult to know how the tests compare to one another. Also, as most of the larger studies we reviewed involved patients pre-selected by geneticists or neurologists, we know less than we would like to about the prevalence of genetic copy number variations in the general population, i.e., the specificity of abnormal microarray results. All of the microarray studies we reviewed were Class III evidence, limiting our ability to make strong recommendations about the use of any specific test. At this time, genomic microarray testing appears to provide the highest diagnostic yield in children with unexplained GDD/ID, with an average of 7.8 percent of tests revealing a diagnostic duplication or deletion. This was based on the studies available, all of which were Class III evidence. We confirmed the findings of the prior practice parameter that G-banded karyotyping is abnormal in about 4 percent of the children with GDD/ID studied, based on both Class II and III evidence, and that subtelomeric fluorescence in situ hybridization is abnormal in at least 3.5 percent of the children with GDD/ID studied, based on Class I, II, and III evidence. Testing for X-linked ID genes was shown to have a yield of 42 percent in one study of boys with a definite X-linked family history of GDD/ID. FMR1 gene testing shows full expansion in at least 2 percent of patients with mild to moderate GDD/ID, and MeCP2 gene testing is diagnostic in 1.5 percent of females with moderate to severe GDD/ID. Tests for inborn errors of metabolism have a yield of nearly 5 percent, while those for congenital disorders of glycosylation and cerebral creatine disorders have yields of up to 1.4 percent and 2.8 percent, respectively, based on Class III evidence. There is still very little research that has quantified the medical, social, and financial benefits of having an accurate etiologic diagnosis in this population of patients, something that has slowed the acceptance and use of newer and more costly genetic tests. In some health care systems, genomic microarray testing has become routine in the evaluation of children with developmental delay, while in others it has been inaccessible due to costs. We continue to need large, prospective studies that evaluate different strategies for testing these children for genetic and metabolic disorders. Some of the studies we reviewed proposed clinical checklists to improve the diagnostic yield of genetic tests. We need to continue to explore this so that we can better target our testing, improve diagnostic yields, and arrive at a correct diagnosis as quickly and cost-effectively as possible. Roughly 50 percent of abnormalities in chromosomal structure include the telomere of the chromosome, or the tip. A test for the absence of the functional end of the chromosome, the subtelomere region, can evaluate many potential abnormalities of that chromosome and possible genetic causes for intellectual development disorders. Michelson DJ, Shevell MI, Sherr EH, et al. Evidence Report: Genetic and metabolic testing on children with global developmental delay. Report of the Quality Standards Subcommittee of the American Academy of Neurology and the Practice Committee of the Child Neurology Society. Neurology 2011; E-pub 2011 Sept. 28. Neurology Today11(19):1,24-25,27, October 06, 2011.